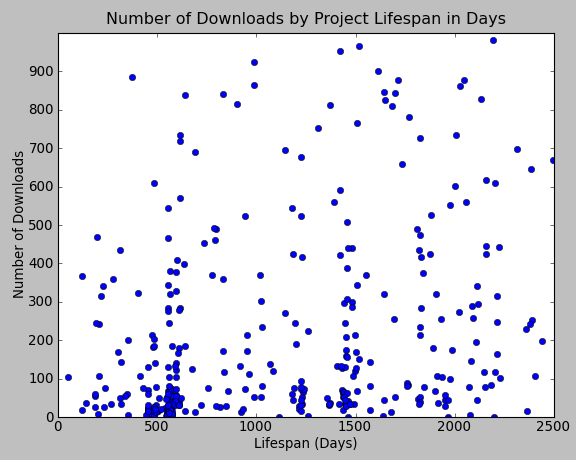 延續 OpenFoundry Attack (二) , 把 Project Downloads 與 Project Lifespan 來比對看看. Project Lifespan 指的是一個 Project 自創造出來到目前為止 ( 2010-04-20 ) 的時間, 在此以天數 (Days) 作為計量單位. 由於在 OpenFoundry 中, Downloads 數量有顯著量級差距, 因此全部一起看反而看不出甚麼. 以下分為幾個不同的 Scales 來看. 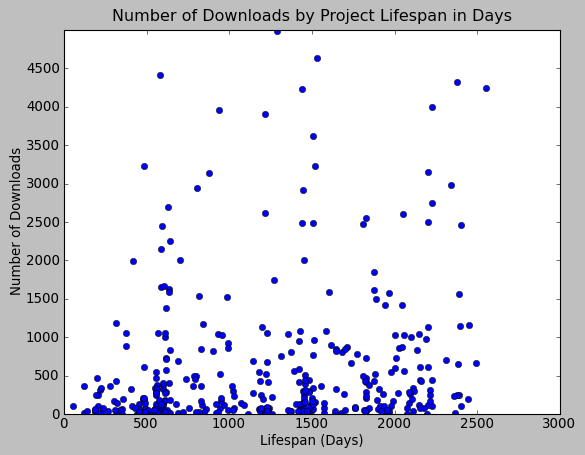 首先是 Downloads 在 0 ~ 100 之間的 Projects. 在此不包含 Downloads 為 0 的 Projects, 在圖上會佔據 Y = 0 的軸線, 意義不大. 較明顯的是 Lifespan 在一年半到兩年之間的 Projects 比較集中一點, 這跟 OpenFoundry Attack (一) 中提到 2008 年 10 月前後的大量註冊 Projects 自然有相關. 但是從 Downloads 的角度來看, 其實並沒有特別的傾向, 算是還蠻平均的. 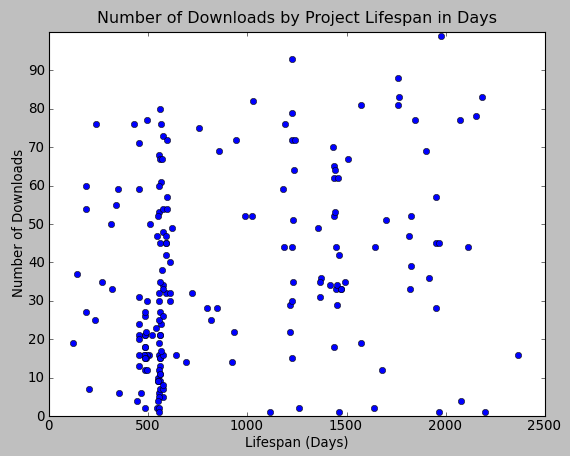 而從其他 Lifespan 的角度來看, 其實在 Downloads 的表現上也是很平均, 並沒有說 Lifespan 長的 Projects ( 也就是比較老的 Projects ) 就比較容易有高的 Downloads 數量. 底下是 Downloads 在 0 ~ 500 之間的 Projects 分佈. 請忽略左下角那團, 那在上圖中已經說明過了. 其他部份也是均勻分佈. 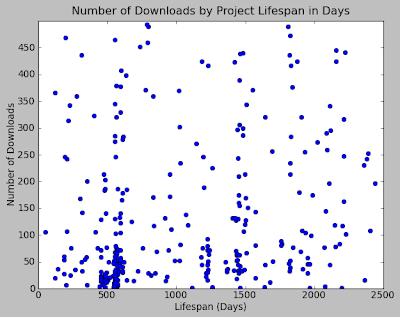 Downloads 在 0 ~ 1000 之間的 Projects 分佈. 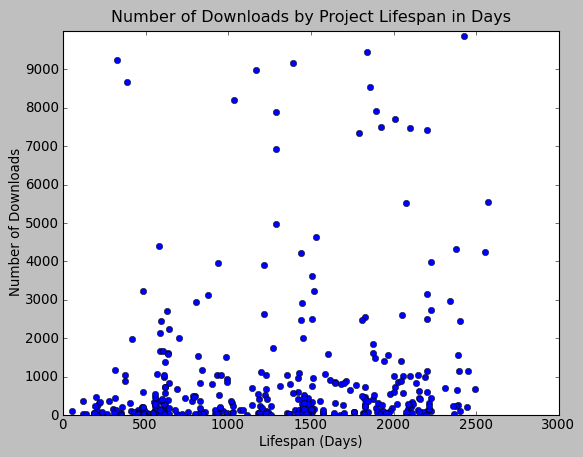 Downloads 在 0 ~ 5000 之間的 Projects 分佈. Downloads 在 0 ~ 10000 之間的 Projects 分佈. Downloads 在 10000 以上的 Projects 數量相對少很多, 代表性低就不看了. 基本上結論是, 在 OpenFoundry 上, 目前看來 Lifespan 跟 Downloads 的關聯性並不高. This entry was posted on 上午10:55 and is filed under open source . You can follow any responses to this entry through the RSS 2.0 feed. You can leave a response, or trackback from your own site.